Summary: This is the first of a series of studies on the overwhelming surprise that is about to overtake the people of this world; what can we do about it, and how can we get ready for it. [Editor’s Note]: The following excerpt is from the book “Another Ark to Build” by W.D. Frazee. This book contains a collection of Friday night vespers talks given at Wildwood. Although given during the ‘70’s, the sermons could easily have been given in the 21st century. If it was relevant back then, how much more so, will we find world events fulfilling the prophecies today. What does this all mean? It means that our redemption is nearer than when we first believed, in fact, even at the door. We see a world movement towards Sunday Law as never before in our lifetimes. 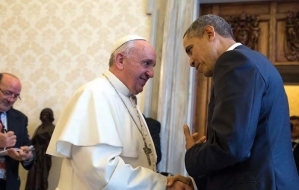 For the first time in history, the Pope will be addressing the US Congress in the fall of 2015. The Sunday law is being touted as a civil right, and a benefit to families, and demand for this legislation is increasing. The Sunday Law movement correlates with the 2nd siege of Jerusalem in 70 AD. The 1st Sunday law attempt was in 1888, and the movement died down, correlating with the armies of Rome pulling back during the 1st siege of Jerusalem. Now, 127 years later, we are again about to face national Sunday laws, and this time, there will be no pulling back. God’s people in the meantime, should have escaped into the country where God would have them be secure from the violence about to hit the cities and the evils found therein, so that they can be alive to proclaim the loud cry message to the world. Readers who are interested in knowing further about preparation for the end times should contact Amazing Discoveries and read the book "Last-Day Events" by Ellen G. White. Now, Paul says that the “brethren are not in darkness”. God’s children walk in the light, so that which surprises the world is not to be a surprise to us. We’re to know what’s coming and get ready for it; but unless we get ready for it, we will be taken in the snare. The reason for knowing what’s ahead is so we can get ready. The thirteenth chapter of Revelation shows the Papacy and the United States of America joining hands in a great program that is to embrace the world: “All that dwell upon the earth shall worship him,” that is, the papacy. And the two-horned beast is the inspiration to get all the world to do that. The twelfth verse says, “He causeth the earth and them that dwell therein to worship the first beast whose deadly wound was healed.” The reason that people are interested in these two great powers today is that they’re hunting for peace and security. This is leading to combinations in every phase of life. Look at the common Market in Europe. [Or today, the European Union.] What’s the basis of it? They want peace and security. What is the reason for these labor unions; these trade associations? What’s the basis of the ecumenical movement? Why are the churches trying to get together? Peace and security. And they will think that they have solved their problems by having these associations. With the papacy and the United States leading out, the whole world will think (for a very short time) that they either have this or almost have it. “For the Lord speak thus to me with a strong hand, and instructed me that I should not walk in the way of this people," saying, say he not, "A confederacy, to all them to whom this people shall say, “A confederacy; neither fear ye their fear, nor be afraid.” What’s driving them? Fear! Fear of want, fear of war, fear of many things.So, with the pope and the United States leading out, there must be combinations. The churches, the trade unions, the nations, the whole world must get together. But God’s people are told in advance, “Say ye not, A confederacy.” Don’t fear their fear, don’t get into that. “Sanctify the Lord of Hosts Himself; and let Him be your fear, and let Him be your dread. And He shall be for a sanctuary,” a place of security. And so in the sixteenth and seventeenth verses He says, “Bind up the testimony, seal the law among My disciples.” Here is the sealing message, the Sabbath put back in the law. “And I will wait upon the Lord, that hideth His face from the house of Jacob, and I will look for him.” While all the world is looking to confederacies, binding together in bundles in order to solve human problems, and get peace and security, God says to His people, Don’t get into that, look up. Look to the Lord. See how it is echoed in Isaiah 45:22: “Look unto Me, and be ye saved, all the ends of the earth; for I am God, and there is none else.” Right here we have the answer to the problem. This is the faith that will save God’s people and take us through the overwhelming surprise, - looking to God. And it is the opposite course, looking to man, that makes it impossible for these world combinations to solve their problems. (The Great Society cannot solve the problems of man.) They are beyond human help; as the Spirit of Prophecy says, “They are struggling in vain to place business operations on a more secure basis.” – 9T, p. 13. It is impossible for the governments of this world, following the plans they are using, to solve the material problems of men. It’s even more impossible... for the papacy to solve the spiritual problems, because the people are educated to look to man instead of directly to Christ. ... Does God intend that His people shall be engulfed in this great disaster? No! “Ye brethren are not in darkness, that that day should overtake you as a thief.” We are to be saved from this overwhelming surprise. In order to be saved, we must be prepared. We must understand what is leading the world to these disasters and we must be kept, not merely from the end result, but from all the cause along the way. ... While the people of this world are talking confederacies, where will God’s people be looking? – upward to Him. That’s the answer. “When we look to man, trouble grows. When we look to God, trouble goes.” And we must learn that day by day in our own personal experience. Do you know that some of the creeds of Christendom are being revised in order to say this—watch this little change—no longer “the Bible is the Word of God,” but the revised statement is, “The Bible contains the Word of God.” Which do you believe? John 17:17 says, “Thy Word is Truth”. The Bible is the Word of God. .. The inroads of modernism, of higher criticism, are weakening the faith of Protestants in the Scriptures. These have prepared the way to accept a human court of appeal, in the person of the papacy, to interpret what is truth. The servant of the Lord tells us that the reason the book, The Great Controversy, deals with the controversies of the past, the apostasy in the early ages, the rise of the papacy, the Dark Ages, and the Reformation is simply this: What has been, will be again. The last conflict into which we are even now entering is the climax of an age-long controversy. The issues are the same. The unseen forces are the same. And Rome that led the Christian world away from the Bible and set up the Pope as the representative of Christ, Rome which in the Dark Ages slew the saints of God, is the same Rome under whose leadership all the world will be united to war against God’s remnant…. Now notice the attitude of the true believers at the time the papacy was in process of formation. 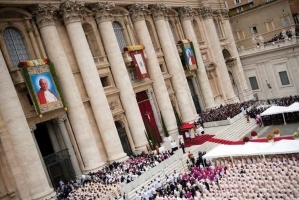 Here are the faithful few who would not go along with the Bishop of Rome and his hierarchy. “To secure peace and unity they were ready to make any concession consistent with fidelity to God; but they felt that even peace would be too dearly purchased at the sacrifice of principle. If unity could be secured only by the compromise of truth and righteousness, then let there be difference and even war.” – GC p. 45 This has been the position of Christ’s followers in all ages: not to make trouble unnecessarily, not to push minor points of difference; but when it comes to a vital principle, no ecumenical idea justifies the selling of truth. Speaking of this apostasy in the early ages, we read in GC p.49, “Almost imperceptibly the customs of heathenism found their way into the Christian church.” How did this compromise come about? “Almost imperceptibly”, that is unnoticed like the twilight falls. Well, this was the twilight, and as the darkness settled upon the Christian world, it came “almost imperceptibly”. That is the devil’s game, to make the advances towards the world so small that the person who resists one of those advances is looked upon as silly, odd, unreasonable, stubborn. And it isn’t always in direct defiance to what God says that this compromise begings. “Rome began by enjoining what God had not forbidden, and she ended by forbidding what He had explicitly enjoined.” – GC p. 290. Rome began by telling people to do things that God had not plainly said they shouldn’t do. Let me illustrate. Here is Christmas for the birth of Christ, Easter for the resurrection. Is there a verse in the Bible that says don’t celebrate the birthday of Christ, don’t celebrate the day of His resurrection? No. So Rome began by introducing things that weren’t expressly forbidden in the Bible. She ended by forbidding what He had definitely told people to do, and the Sabbath is the great outstanding example. When men get in the habit of accepting as religious guides those who tell them to do more than the Bible says, they will inevitably end up following those guides to do what the Bible has forbidden. And this is the path that Protestantism so-called has been following for many years. “As the Protestant churches have been seeking the favor of the world, false charity has blinded their eyes. They do not see but that it is right to believe good of all evil; and as the inevitable result, they will finally believe evil of all good.” – GC p. 571. This is what is responsible for their current attitude towards the papacy. The popular thing in the Protestant churches today is to pat everybody on the back, and for the moment even Seventh- day Adventists are riding on the ride of popular favor, the ecumenical spirit. Many in the popular churches are ready to welcome Seventh-day Adventists as a part of the great Christian world. But the same spirit that leads them to welcome us is leading them to welcome Rome. We need to look very carefully at the hand that’s stretched out to us, remembering that it is also offered to the Vatican. Let us not be flattered by the spirit of compromise. That hand which has been extended toward Rome will eventually be used, not to welcome us, but to smite us. We need to look deep into our own hearts and see if there is anything in our souls that responses to this spirit of compromise. Are we weary of the war? Are we tired of the toil? Do we long for release from the conflict, and will we, in order to buy that release, sell the truth? That’s the question. Will we give up conscientious convictions; will we soft-pedal the Word of the Lord? God forbid! For a short time this world is going to be united… all the nations will unite to oppose God in the person of His witnesses. Where will you and I be? On one side or the other. We’ll either be with Jesus and His remnant church, conscientiously standing for what the Word of God says, all ten of His commandments, or else we’ll be with the great popular movement which has sold the truth in order to buy peace…. Oh friends, when the voice of God ends the captivity of His people, when His law is seen in the sky, there will be a terrible awakening among all these churches that have combined together in compromise to buy peace. The union which the great apostate has cemented will fall to pieces. … The whole world is going to be plunged into the scenes of the French Revolution. Peace? Not peace. Sacrifice of the truth can never lead to peace. And so it means much to you and to me this morning to answer the question, Do we love the truth enough to die for it, enough to live for it? Or are we willing to compromise?